I deal with ridiculous amounts of paperwork in my day job. I think real estate transactions generate too many documents. 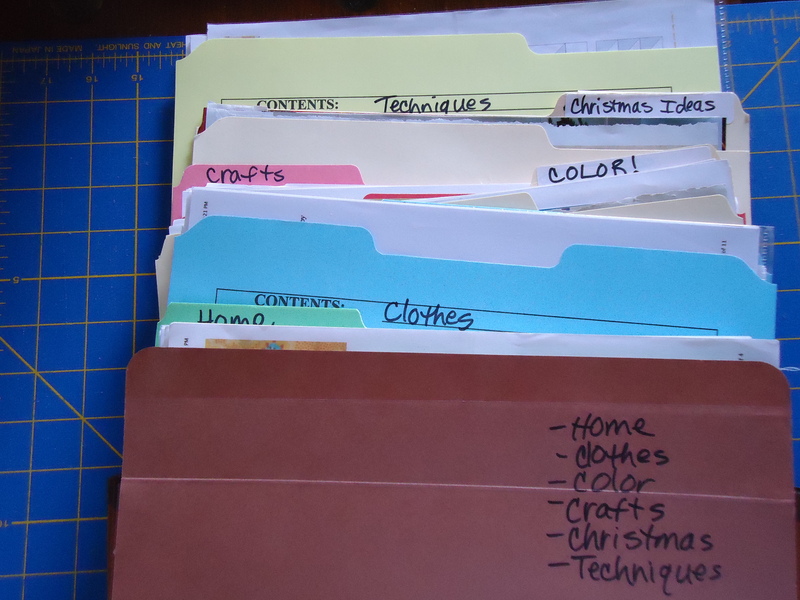 To keep up, I have to be very organized, which carries over to keeping paperwork at home organized. 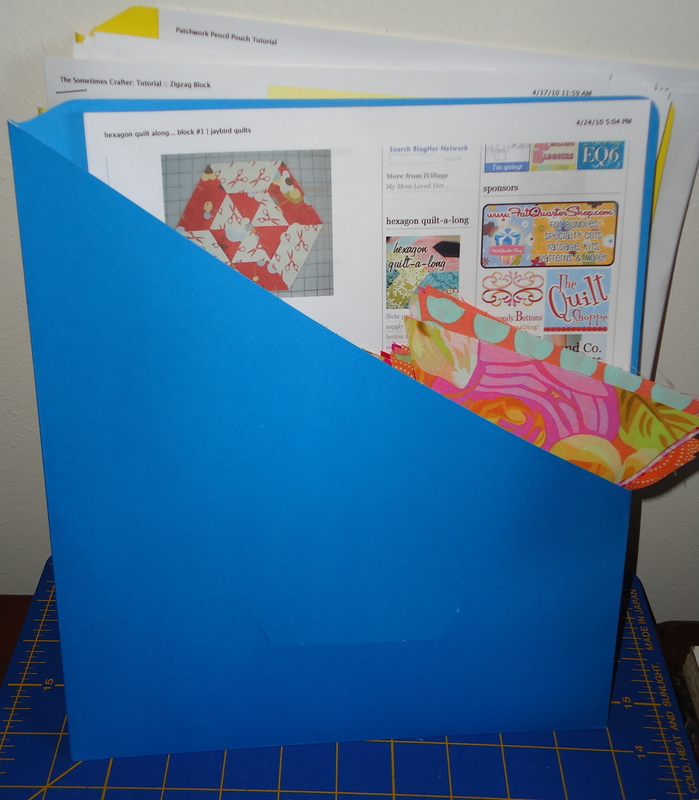 The home filing is much more interesting – sewing and knitting patterns! There are hundreds of wonderful tutorials offered in blogland, which I usually just bookmark. Since I do all of my computing on a laptop, sometimes I need to print a pattern so I can follow along as I make the project. Or I just want to save it for future reference. I don’t have any of those fancy magazine holders to store my patterns and magazines, mainly because I’m cheap frugal and short on time to make them for myself. My sewing room is only 10 feet by 8 feet, thus I don’t have a lot of space, so no room for a filing cabinet. I make do because I think I am lucky enough just to have my own room! 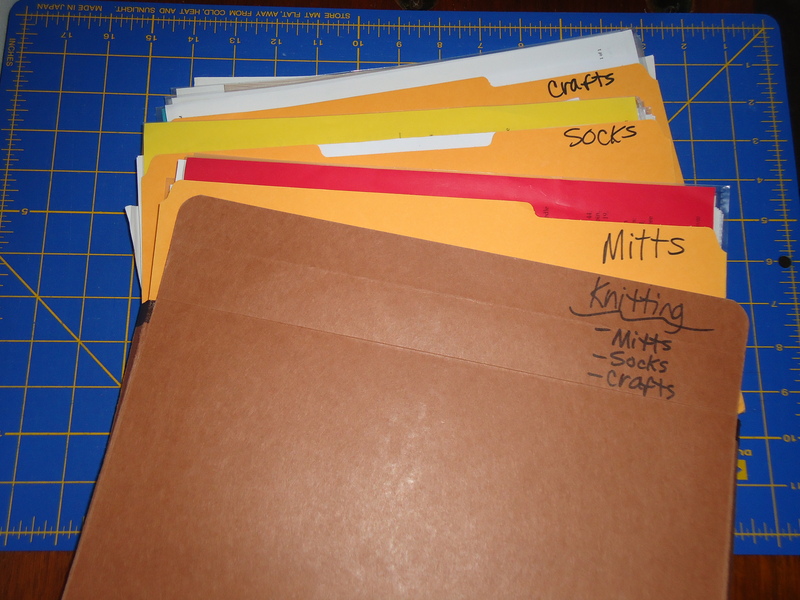 I’m a simple girl, so I use accordion file folders to keep my patterns and reference information organized. I love them because they expand, meaning there’s always room for more ideas. I try to keep them coordinated – pink for quilt patterns, purple for bag patterns, green for home patterns, blue for clothes, vanilla for color inspiration, red for crafty projects, yellow for techniques. I keep them on my book shelves (as you can see in the photos above) in between the magazines I save and reference books I collect. I broke the patterns down into categories of handmade projects, which makes life so much easier when I have an idea to just browse through my files. I keep files similar to this for my shop too. 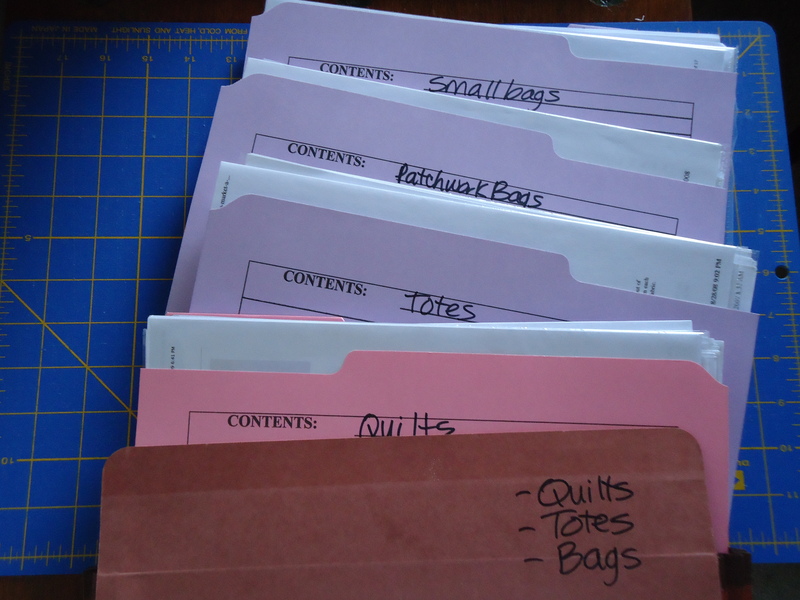 The other filing practice I like to do is keep my current project in a plastic sheet protector, which allows me to store the instructions and cut fabrics together. Since I don’t like cutting, I tend to cut several projects in one day, in essence “stocking up” on cut projects, so they are ready when I find some free time. I also like using these pocket file folders for the same purpose. Once I’m done making the project, I file the pattern into the appropriate folder shown above, and reuse these protectors or pocket folders. These best practices have saved me time and patience! Feel free to share your ideas or practices in the comments or link to your blog. Your sewing room looks so tidy and organised Terri! Love all your initiatives to organise it. I love the look of your bookcase – looks like lots of inspiration there! Wow Terri! I’m impressed. And you have a CHAIR in your sewing room! Mine is little too, but I have two desks (because it doubles as my office) and a giant IKEA unit, so no chair I’m afraid. You’re inspiring me to reorganize a bit around here. Well I had just got the big room, then we had to move. Which we are still working on. My big room was the double car plus garage the kids closed off for me and fixed up. It had so much room. Now we are in an apt. I have never lived in one before. 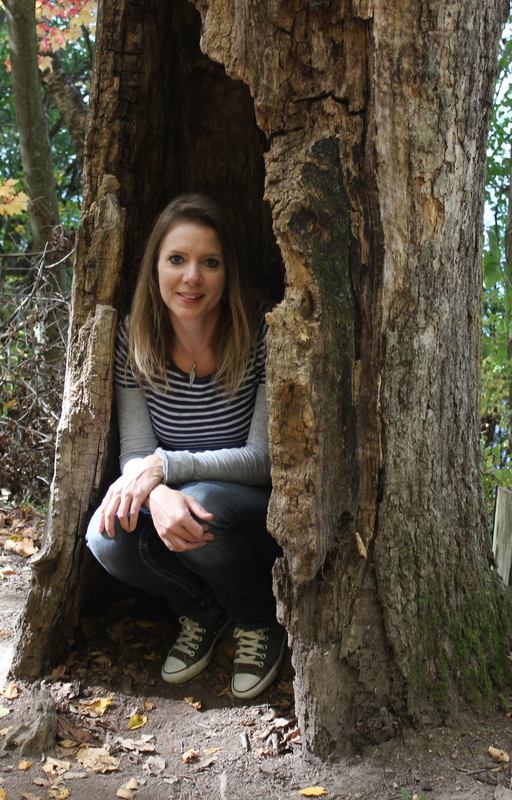 We can’t get a house until we sell the other one. I’m glad you showed your room for I’m having to down size and I need ideas. Most of my fabric I will have to leave behind for I have way to much. We are 3 hours from where we lived so I decided until the house sells it will be where I go to shop for awhile. I guess I need to get alot of things made now. No more buying for awhile. Thanks so much for the ideas, could’nt come at a better time. I cannot comment further because I need to go to my sewing room and fix my mess. you have some good systems in place there!! 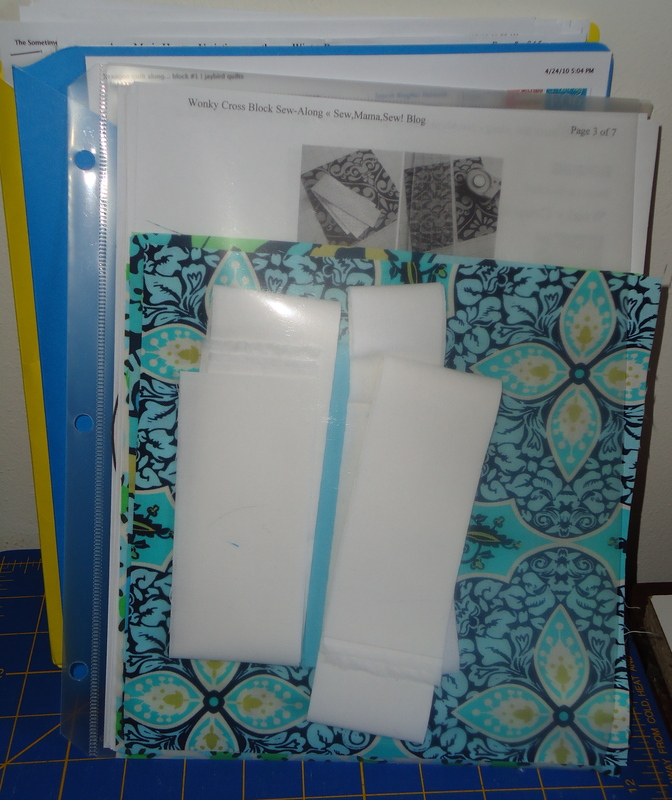 i use plastic page protectors in binders for lots of loose paperwork.. and magazine patterns that have been taken out of magazines..
and i have a box for patterns.. but it is overflowing at the moment!! ps.. i spot my blog printed! I admit it. I purchase too many magazines. To deal with the volume, I keep only the pages of magazines with patterns that I find inspiring from a color perspective or that I honestly think I will use. I have a friend who then sorts through the cast off before recycling (which works well because we have diverse preferences). Each pattern is store in its own page protector. 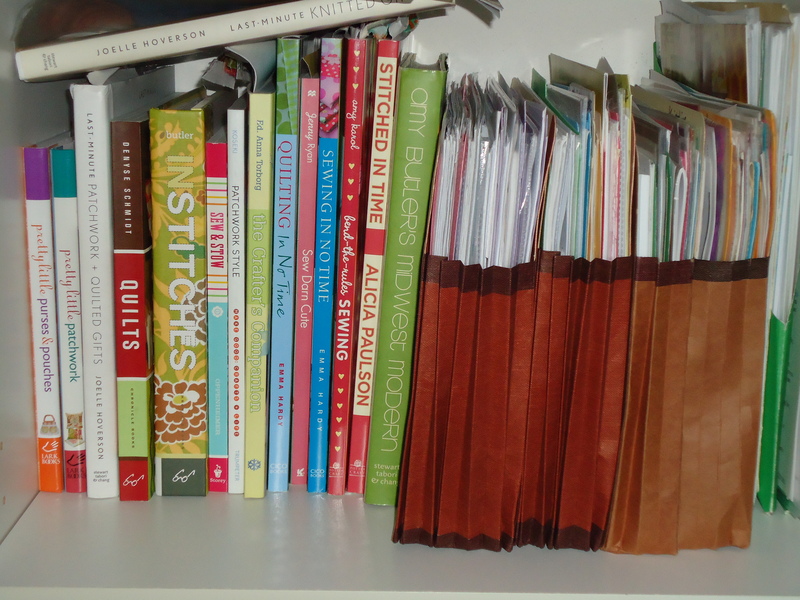 I only have 3 large binders filled with quilt patterns, 1 with sewing patterns, 1 with embroidery projects and 1 with other crafting projects. As you said, the page protectors are handy for holding trial blocks or pieces from your stash which you may have purchased for the project. Lots of patterns ready to go….the problem is selecting one! I’m so jealous of how organized you are!! I know I mentioned being a product of the digital age before, so my e-files are organized like no other. My physical files, however, leave a lot to be desired. I’m not good with keeping papers organized. I don’t mind getting everything organized…I just don’t keep it that way. I love that your current project is tucked nicely inside a plastic folder. My current project is strung out all over my craft room and my kitchen table!!!!! Luckily my husband is very VERY easy going and doesn’t mind my messes. Thanks for the tips, and the link to those pretty magazine holders! wow. i am IMPRESSED! i could use some more organization in my life. 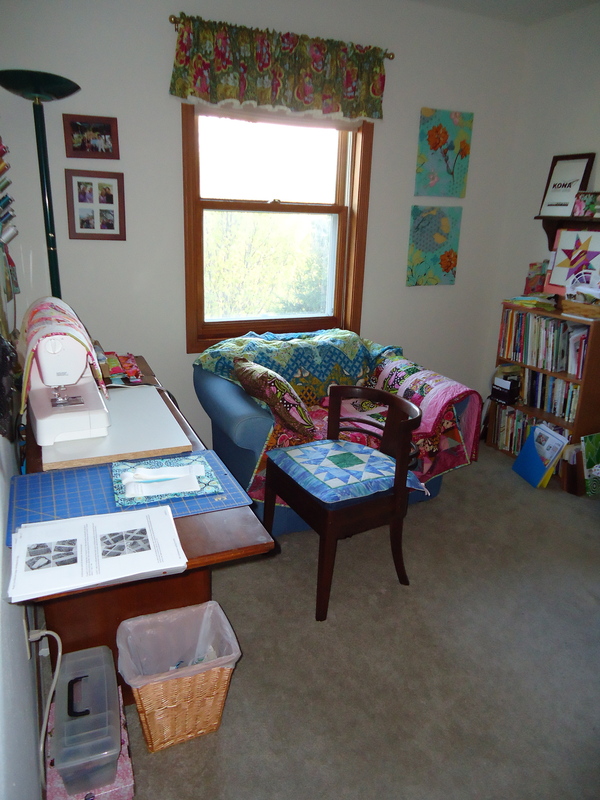 I loved seeing your sewing space where you create. Good idea to cut your projects in advance so you can just sew when you get ready. I keep my patterns in those sheet projectors in a notebook and I purchased a couple of those leather magazine holders at Ross with a giftcard I received. They sure help to keep the magazines upright and organized, I need a few more. I admire your organization plan and that it works so well for you. If I can keep track of fabric and supplies, I’m happy! My word girl! You sure are organized 🙂 Yes, you are lucky to have your own room. I don’t know what I would do without my own sewing studio! Thanks for the tips! I love an organized gal!!! 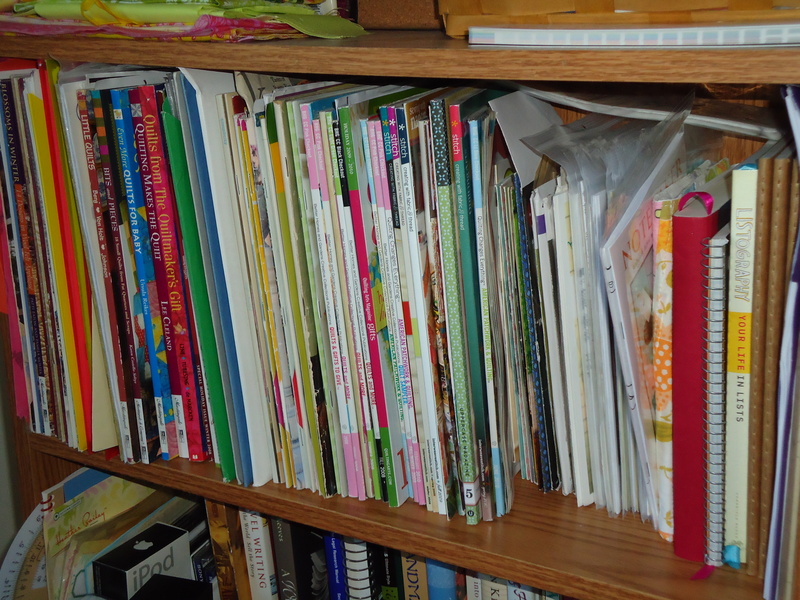 I’m inspired by your organizing of your books and patterns. I have a stack of papers that can really use organizing. Thanks for the hints. Your sewing room looks very colorful. Well then. You are officially my hero. Skinny, creative, AND organized! Thanks for the ideas. Love your systems. Love your quilt room too – so bright and cheerful. Perfect place to spend lots of fun hours.